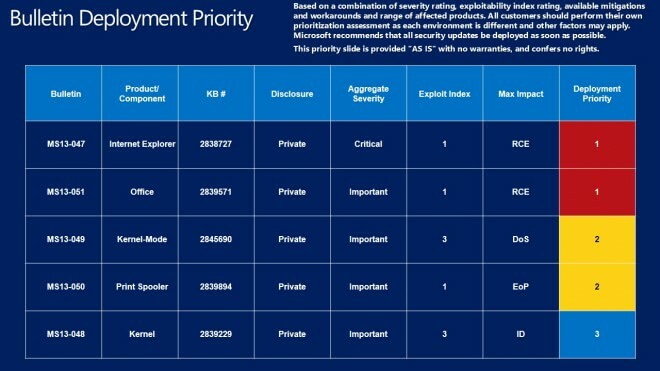 Microsoft released a total of five security bulletins addressing 23 different vulnerabilities today of which four affect client and server versions of the Windows operating system while one is affecting Microsoft Office. One bulletin has received the maximum severity rating of critical, the highest possible rating, while the remaining four received one of important, the second highest. 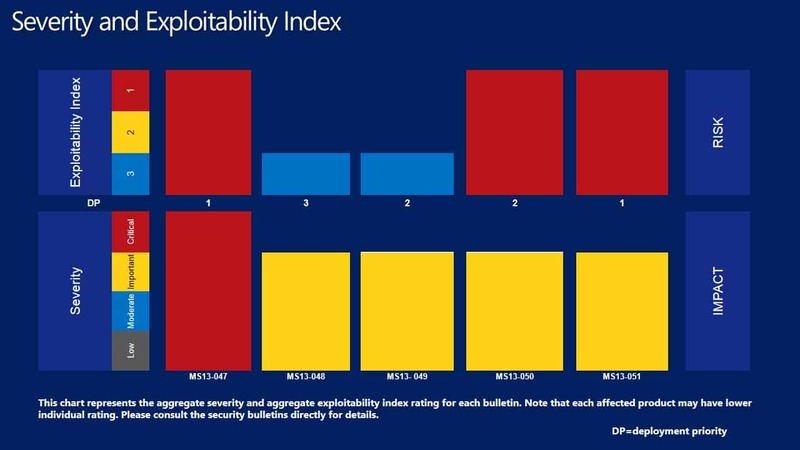 This does not mean that all versions of Windows or Office are equally affected by those vulnerabilities. Check out the operating system distribution listing that details how individual versions of Windows are affected this patch day. Windows editions and versions may be affected in different ways to vulnerabilities. A simple example is a vulnerability in a feature that Microsoft introduced in a later version of the operating system. In this case, all previous versions of Windows would not be affected by the vulnerability at all, as the affected feature would not exist in those versions. Windows XP is affected the least this time in terms of vulnerabilities followed by Windows RT, then Vista and Windows 7, and finally Windows 8 which is affected most severely. First MS13-047 (Internet Explorer, critical) and then MS13-051 (Office, important). Then MS13-049 (Kernel-Mode, important) and then Ms13-050 (Print Spooler, important). The automatic update feature of Windows is the easiest option when it comes to installing security updates.This is an automated process and you do not really need to do anything as updates are installed automatically on your system. All Windows users can tap on the Windows-key, enter Windows Update and select the appropriate option here to open the updater of the operating system. 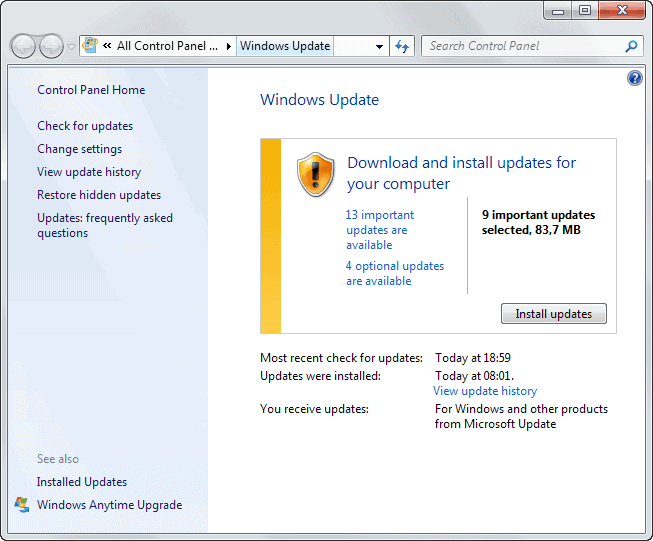 Click on the check for updates button first to retrieve the latest updates from Microsoft before you hit the install updates button. You can browse the updates that Windows has found before you do so, disable some or include others that are not installed automatically. It is alternatively possible to use Microsoft’s Download Center to download and install updates, or third party programs which you find listed on this page. This entry was posted on Wednesday, June 12th, 2013 at 9:58 am	and is filed under General News. You can follow any responses to this entry through the RSS 2.0 feed. Both comments and pings are currently closed.